Slugs: We’d like to hear from you. 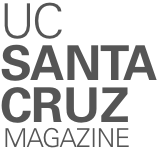 Send Alumni Notes to magazine@ucsc.edu, or use this form. ’71 Ken FEINGOLD and his wife Moira FEINGOLD (Cowell ’72) have moved to Nicasio in West Marin. He will continue to handle selected legal matters and continue his mediation practice in Northern and Southern California. ’74 Charles EADIE has been honored with the Santa Cruz Chamber of Commerce’s Man of the Year award. Eadie has over 30 years of consulting and public agency experience in planning and redevelopment in the Santa Cruz area, including work as director of campus and community planning at UC Santa Cruz, and in the cities of Santa Cruz and Watsonville. ’81 Marion LESLIE notes, “Not all Slugs have been high achievers, but working for the San Jose Public Library for almost 30 years has had its rewards, and working at McHenry to help pay for college definitely helped prepare me.” Yuichi SHODA is one of three psychologists who was honored with a Golden Goose Award for a world-famous and highly influential longitudinal research project that has come to be called “the marshmallow study.” The award is given by the Association of American Universities, together with the American Association for the Advancement of Science, the Science Coalition, and other agencies. Shoda is a psychology professor at the University of Washington. The other two being honored are Walter Mischel, now of Columbia University; and Philip Peake, now of Smith College. The study, started in the 1960s and funded by the National Institutes of Health and the National Science Foundation, measured the ability of children 4 to 5 years old to delay gratification. They were given the choice between a single marshmallow they could eat right away or two marshmallows if they were willing to wait. ’01 Monica HOFFMAN received her Ph.D in communication and science studies from UC San Diego in June. The title of her dissertation is “Malaria, Mosquitoes, and Maps: Practices and Articulations of Malaria Control in British India and WWII.” Her advisor was Valerie HARTOUNI (Ph.D. ’87, history of consciousness). ’77 Susan GIBBONS is an adjudications officer at the EB-5 Immigrant Investor Program, U.S. Citizenship and Immigration Services, Washington, D.C.
‘82 Jim JOHNSEN was appointed to serve as the 14th president of the University of Alaska in 2015. His most recent experience includes service as an executive with Alaska Communications and previously with Doyon, Limited. President Johnsen also served the University of Alaska from 1996–2008 in several executive roles including vice president of administration and chief of staff. ’88 Erik DRUMPF, a professor of political science, won the Franc A. Landee Teaching Excellence Award at Saginaw Valley State University. He is married to a fellow Banana Slug, Jesse DONAHUE (’89). ’72 Tobeylynn BIRCH retired in January after almost 40 years in librarianship at Loyola Marymount University, where she was associate dean of the William H. Hannon Library. She is enjoying the time to get back into knitting and other crafts, to putter around the house, and especially to play with her first grandson, born in February. ’74 Michael BROWN is working as a sustainability consultant. He is also a part-time lecturer at UC Santa Barbara teaching an undergraduate industrial ecology course. He’s also serving on the California Ocean Protection Council as a governor appointed public member. ’89 Gayle (Bruno) WEYMAN and her husband, Ryan, celebrated their 25th wedding anniversary in January. They met and fell in love at UC Santa Cruz in 1989. ‘03 Jamie SIEGEL, senior systems analyst for student records at UC Santa Cruz’s Office of the Registrar, remembers when she, Allison MORRIS (‘03), and Jeraline SINGH (‘02) lived together in the Galileo dorm building at Crown College in 1999. Now, circumstances are bringing them back together again. “This February, 18 years later, Jeri and I will be bridesmaids at Alli’s wedding!” she reports. ’69 R. Zachary WASSERMAN, an attorney at Wendel, Rosen, Black & Dean LLP, was named a 2016 Northern California Super Lawyer. Northern California Super Lawyers, a Thomson Reuters rating service and publication, selects outstanding attorneys from more than 70 practice areas through a nomination process that comprises a statewide survey of lawyers, detailed peer review, and extensive research of each candidate. ’77 Barbara EDELSTEIN has had solo shows at the Ruth Bachofner Gallery in Los Angeles and at the Christian Duvernois Gallery in New York, as well as many group shows in the U.S. and Asia. She is an art professor at the New York University Shanghai campus in China. ’97 Dante CANTÚ, now living in New York’s Hudson Valley, was recently honored by the National Resource Center for The First-Year Experience and Students in Transition as an “Outstanding First-Year Student Advocate” for his leadership and contributions in the area of student success, student learning, and inclusive excellence. Cantú is helping to develop what he describes as “a data-informed set of integrated curricular support services at the State University of New York at New Paltz.” He enjoys his eight-minute stroll to campus from his home in the village of New Paltz, which reminds him a lot of Santa Cruz. He would like to connect with “like-minded Banana Slugs” via LinkedIn. ’76 Jonathan REDDING, an attorney at Wendel, Rosen, Black & Dean LLP, was named a 2016 Northern California Super Lawyer. Northern California Super Lawyers, a Thomson Reuters rating service and publication, selects outstanding attorneys from more than 70 practice areas through a nomination process that comprises a statewide survey of lawyers, detailed peer review, and extensive research of each candidate. ’79 Julie HUTCHINSON recently changed lanes and is now working as a realtor in residential real estate after 12 years as SVP of casting at Universal Pictures and many years as a casting director and casting executive. She works with Coldwell Banker Residential Brokerage in Los Angeles. And, she says, she has a 15-year-old daughter who has UC Santa Cruz on her short list of schools to attend in two years. ’93 Aaron EVERHART is founder of “HATCH! PROGRAM,” which he describes as an “entrepreneurship ecosystem builder” in Vietnam. HATCH! also produces the annual “HATCH! FAIR,” now in it’s fourth year as one of the largest combined startup exhibition and entrepreneurship conferences in Southeast Asia. Now, Everhart is announcing the formation of “HATCH! VENTURES,” which will provide incubation services and seed capital funding for innovation- and social impact-based enterprises in Vietnam. ’15 Kyle CZIMBACK is working as an interviewer for Research America, Inc.
’79 Tracy GREEN, an attorney at Wendel, Rosen, Black & Dean LLP, was named a 2016 Northern California Super Lawyer. Northern California Super Lawyers, a Thomson Reuters rating service and publication, selects outstanding attorneys from more than 70 practice areas through a nomination process that comprises a statewide survey of lawyers, detailed peer review, and extensive research of each candidate. ’94 Ernie BRAY was recently named semifinalist in the EY Entrepreneur of the Year 2016 San Diego Awards. Bray, founder and CEO of his firm ACD, has led his company to five annual rankings on Inc. magazine’s Inc. 5000 and four years on Deloitte’s Technology Fast 500. ‘95 Esteban LOPEZ, Blue Cross and Blue Shield of Texas regional president, has been selected as a member of the Presidential Leadership Scholars Class of 2016, a partnership designed for leaders who share a commitment to helping solve society’s greatest challenges. Scholars draw on the resources of U.S. presidential centers (Lyndon B. Johnson, George H.W. Bush, William J. Clinton, and George W. Bush) to take their leadership strengths to a higher level. ‘76 M. Jay YUROW, a real-estate lawyer in the Hirschler Fleischer law firm, was mentioned prominently in the 2016 edition of Chambers USA: America’s Leading Lawyers for Business. The publication listed a total of 17 Hirschler Fleischer lawyers as among the best in Virginia and leaders in their fields. ‘85 Mary Ann LITTLETON was presented the 2016 Distinguished Faculty Award for Teaching, one of the top three honors given to faculty each year at East Tennessee State University. ’11 Julie GAUTIER-DOWNES reports that Saranac Art Projects in Spokane, Wash., hosted her exhibit, “Trail’s End,” a walk-in installation, in which she combines her photos of the Mojave Desert with a seemingly abandoned living room that she constructed in the gallery. “Though a construction, Trail’s End seeks to evoke the same feelings of loneliness and loss that the real abandoned homes have, leaving the audience wondering who could have inhabited the spaces and what circumstances drove them away,” Gautier-Downes says. ‘13 Jamie O’QUINN will graduate from San Francisco State University with a master’s in human sexuality studies. ’69 Stephen KESSLER is the recipient of the 2016 PEN Center USA Translation Award for his version of Forbidden Pleasures: New Selected Poems by Luis Cernuda (Black Widow Press). ’93 Alexandra WITZE made the short list for the 2016 PEN Literary Science Writing Awards for her book Island on Fire: The Extraordinary Story of a Forgotten Volcano That Changed the World. ‘00 Judith HAAS, associate professor of English at Rhodes College, was presented the 2016 Jameson M. Jones Award for Outstanding Faculty Service at Opening Convocation Aug. 19. The award honors a current faculty member who has rendered exemplary service and provided leadership to the Rhodes community. It is presented in memory of Jameson M. Jones ’36, who served as professor of moral philosophy and dean of the college from 1955 to 1971.